Councilors Andrea J. Campbell (center), Mark Ciommo (left), and Michael F. Flaherty at Monday’s hearing. 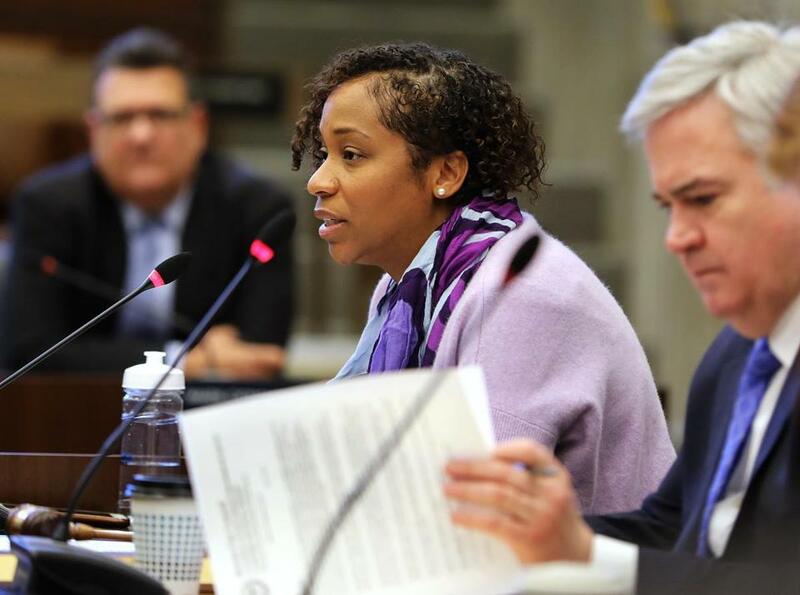 Boston city councilors are considering whether to extend their terms to four years, an effort Council President Andrea Campbell said would strengthen the role of the council. “There are ways I think we can change some of our election procedures . . . to strengthen us as a body, making us more autonomous,” Campbell said during a hearing Monday, in which the council considered several changes to local election laws. “How do we strengthen the council, as an institution?” she asked. In addition to extending the council terms from two to four years, Campbell proposed banning candidates from running for two city positions at once and requiring that the city hold a special election whenever there is a vacancy in one of the council’s four at-large seats. The issue of special elections arose recently when Althea Garrison ascended to the council seat left vacant in January by Ayanna Pressley, after her election to Congress. Garrison placed fifth for one of the four seats in the 2017 election, and under city rules she qualified for the seat without the need for another election and will fill the remainder of Pressley’s term. Campbell said her proposal was not a reflection on Garrison personally, but said she believed that any councilor should be elected by voters. City rules already require a special election when there is a vacancy for one of the council’s nine district seats. “I think it would be more democratic,” Campbell said. Garrison opposed the proposal at Monday’s hearing. Campbell also said that the extension of council terms to four years would allow councilors to focus more on their work and their roles in city government, without having to campaign for the seat every two years. “It allows the council to be more effective in their jobs,” she said. If passed, the proposals would be sent to the State House in the form of a home-rule petition, and would need approval from the Legislature. The council passed a similar proposal to extend the terms in 2016, but it did not receive state approval. Dion Irish, the city elections commissioner, did not weigh in on the proposal but said the city spends about $800,000 every election. That means the city could save roughly $1.6 million if it did not host preliminary and general municipal elections every two years; the city would host local elections only every four years when there is a mayoral election, which tends to increase voter turnout. The full council is slated to consider the proposals Wednesday. But there is so far no consensus. Councilor Mark Ciommo questioned the need for a special election for an at-large vacancy when one of the objectives of extending term limits would be to save money by not holding more elections. And Councilor Michelle Wu questioned whether the proposals would have an unintended consequence of discouraging people from running for office against incumbents who have cemented their positions — and built up their campaign war chests — over four years. Councilor Matt O’Malley disagreed that four-year terms would dissuade challenges, saying the extended terms would allow all candidates more time to build up their own profiles and campaign accounts. A city councilor is paid roughly $100,000 a year. Ian Kea, communications and advocacy manager for Mass Vote, said his organization would support extending the council term, saying it would ultimately boost voter interest in council elections. Also, councilors could spend more time on their jobs, and less time campaigning. “For too long, and too often, we have to see public officials campaigning for half the time,” he said. He also said the city should host special elections for vacant at-large council seats so that voters can have a say. And he said candidates should not be able to run for two different offices. “Elected office is a respected privilege, and should be treated as such,” he said. @globe.com. Follow him on Twitter @miltonvalencia.